Reverse osmosis is one of the most popular water purification technologies available and is often used in domestic households for drinking and cooking water but is also used in a wide range of commercial environments such as dental practices and veterinarians. 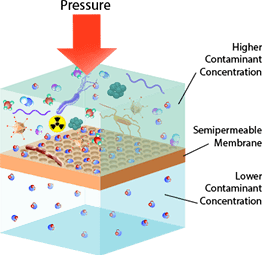 If you push water that contains dissolved solids (measured in TDS - Total Dissolved Solids) against a semi-permeable membrane, the membrane allows pure water molecules through and rejects (on average) 97% of the dissolved solids. The rejected minerals and metals are piped to the drain and the pure water is stored for later use. 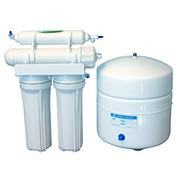 It should be pointed out that this process purifies the water rather than filtering it; to reach the same level of purity using conventional filtration would require more than 100 water filters connected consecutively. 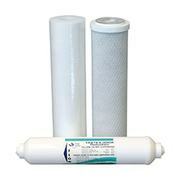 We offer a great range of reverse osmosis systems, replacement membranes and filters all of which include FREE UK delivery. You can browse our range below and if you need any help, please don’t hesitate to get in touch today.